Project leader Steve Burke talking to MSc students from UCLan about the restoration of the pinnacle in Clitheroe Castle grounds. Photo: R Martin Seddon. Campaigners striving to restore and preserve a unique piece of Clitheroe’s heritage are celebrating news of a vital cash injection. A special project team from Clitheroe Civic Society was thrilled to receive news of a £55,900 grant from the Heritage Lottery Fund. 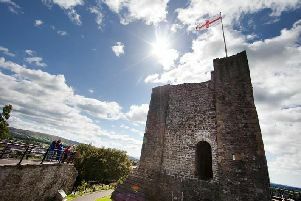 It is the vital component which will allow them to press ahead with plans to save the Clitheroe Castle Gardens Pinnacle. Sir William Brass. Picture courtesy of the National Portrait Gallery, London. As previously reported in The Clitheroe Advertiser, the intricate and ornate mounument, set on a stone plinth in the grounds of Clitheroe Castle, is a pinnacle – or turret – which once adorned the roofline of the Houses of Parliament in London. The pinnacle dates from the rebuilding of the Houses of Parliament in 1834 after a fire. However, part of the rebuild was affected by London’s pollution and the pinnacle had to be dismantled and taken down. It came to Clitheroe thanks to Sir William Brass, the town’s MP for 23 years, from 1922 to his death in 1945. He thought the historic pinnacle would make a fitting feature to mark the coronation of King George VI in 1937 and presented it to the people of Clitheroe to “Give something to this ancient borough which came from the Mother of Parliaments”. Sir William paid for the pinnacle’s transport and erection and also for creating the rose garden around. Sadly, after 80 years, the Clitheroe Pinnacle is in need of significant work to preserve it for generations to come. Ironwork within it is corroding, damaging the stonework and, without restoration, it will crumble. Now, thanks to the successful Lottery bid by the project team, comprising Pauline Wood, Len Middleton and Steve Burke, work can press ahead. They are also grateful to the people of Clitheroe for getting behind the project, attending a public meeting and signing a petition in their thousands. The Lottery bid could not have succeeded without that show of public support. Financial support has also come from the Duchy of Lancaster, Clitheroe Town Council, Lancashire County Council, the Rotary Club of Clitheroe, North Lancs Clarion Cycling Club and private donors. The project will not only repair and consolidate the pinnacle, but will also provide improved on-site information of its history, so visitors can better understand what it is and how it came to be there. Clitheroe Civic Society will lead and co-ordinate the professional, educational and community project partners in this venture, the first project the society has undertaken in its 53-year history. Partners already include pupils from Pendle Primary School, Clitheroe, who have visited the site and had talks by Civic Society members on the history and significance of the pinnacle. They will play an active part in working on and developing an improved interpretation of the pinnacle from a primary school perspective. Post Graduate MSc Students from the University of Central Lancashire’s Building Conservation and Regeneration Course have also visited the pinnacle and some will be basing a module of their coursework on the repair project, while the whole department will be involved in a crucial 3D survey of the pinnacle. This work, and a Ground Penetrating Survey by a specialist team from Salford University, will be vital in providing accurate and detailed information to the conservation architect and specialist masonry contractor appointed to carry out the work. Meanwhile, local historian Steve Ragnall will lead research into Sir William Brass and his involvement with the pinnacle. Relatively little is known locally about Sir William and the Civic Society will work with Steve to provide more information about Clitheroe’s pre and post-World War II MP. The architect appointed to deliver the project is Ivan Wilson, Director of Clitheroe-based IWA Architects, which works across a wide range of sectors with a particular focus on conservation projects, historic churches and listed buildings. Leading and co-ordinating the Interpretation and Project Presentation part of the initiative is another local man, Chatburn-based Dr R. Martin Seddon. It is hoped the repair, conservation and improved interpretation of the monument can be completed by the end of this year, the work recorded on a dedicated project website and a “blog” designed to encourage wider public interaction. Though the Lottery grant and other funding enable the project to start, more funding is still needed to see it through. Two fund-raising events have already been organised to help meet the shortfall. On June 20th there will be a Cheese and Wine Evening at Downham Hall, courtesy of Lord and Lady Clitheroe and as a part of the Ribble Valley’s Annual Food Festival. And on June 26th a grand Summer Concert will be held at The Grand in Clitheroe.